Over the last 5 years, the health and wellness sector has seen a huge rise in demand from consumers and as creating a balanced lifestyle becomes increasingly important to millions of people across the globe, the sector is continuing to see massive growth. Health is slowly but, surely finding a way into most consumers shopping experience and many of us are becoming increasingly attracted to products that have health benefits embedded within them. Over the Christmas period, we will be managing a team of brand ambassadors for the Homedics group within several Debenhams stores across the UK and this week we played host to a great training session based around the products within the Homedics range. As always, detailed search and selection of our brand ambassadors was incredibly important for this campaign and we have found a brilliant team who have a range of experience across multiple, relevant industries, ranging from working as brand ambassadors for House of Marley- https://www.thehouseofmarley.co.uk/ (part of the Homedics group) to working as professional beauty therapists. We have a strong feeling that the combination of sales skills and their previous experience will be of great benefit during their time on the campaign. 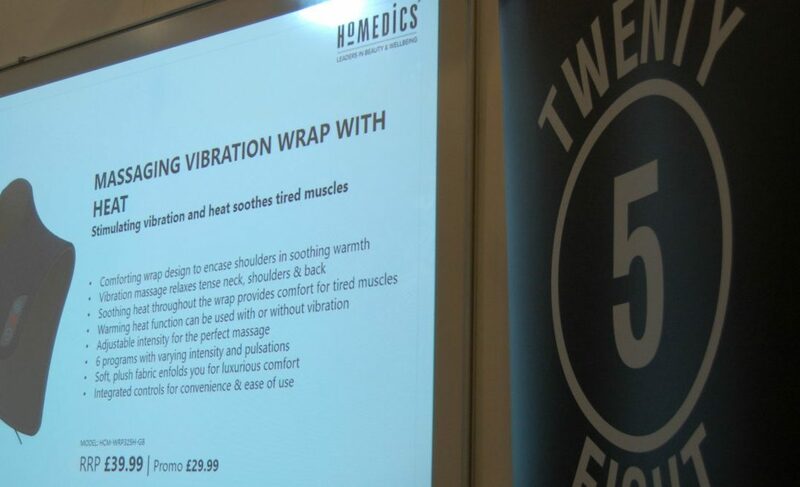 The training that was delivered by the Homedics team was very interactive and in our experience, when it comes to technology products, face to face, hands on training always has a huge positive impact on our team’s performance in store. Being given the opportunity to use and test the products during a training session proves useful because it gives our brand ambassadors stories and anecdotes that potential customers will be able to relate to. With a range that features a variety of products which are available for use in the home, work or in the car, it was important for our team to fully understand the key features of each individual product and how best to guide a consumer through the sales journey once in store. All the team were also generously given a product each to take home and test in their own time which will ensure that they are familiar with the benefits, features and functions before demonstrating to potential customers. We’re very excited to be venturing into a new part of the technology industry, as are our teams and we look forward to seeing the results following the campaign. Our CES schedule is already crammed with meetings with Health and Wellness companies, which is just as well, as 4 days in Vegas is a gruelling schedule, so having a nice footspa and a massage is going to be the order of the day I am sure!